The Pina Colada, Puerto Rico's official national cocktail since 1978, is a creamy, fruity Tiki style drink made with fresh pineaple juice, cream of coconut and rum. Coco Lopez, the original cream of coconut, is said to have been the inspiration for our modern day Pina Colada recipe. Developed by Ramon Lopez-Irizarry, a Professor of Agriculture at the University of Puerto Rico, supposedly Coco Lopez was introduced to bars in 1954 along with blenders and a challenge to use the ingredient in signature cocktails. Therein lies the beginnings of the tales of this tropical Tiki style drink. 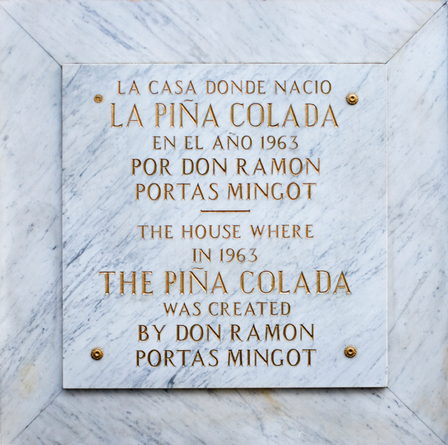 Originating in Puerto Rico, there's a lot of folks who lay claim to the creation of the Pina Colada, including a story that attributes the very first recipe to the pirate Roberto Cofresí (El Pirata Cofresí) who was said to drink a concoction of rum, pineapple and coconut milk sometime in the early 1800's. Ramón “Monchito” Marrero Pérez of the Caribe Hilton in San Juan who was said to have blended up a version using local rum, pineapple, condensed milk and coconut cream sometime around the mid 1950's. Ricardo Garcia, also from the Caribe Hilton, says he created the Pina Colada when he had run out of coconuts for his signature Coco Lopez cocktail, substituted pineapple juice then served his in a real pineapple shell. 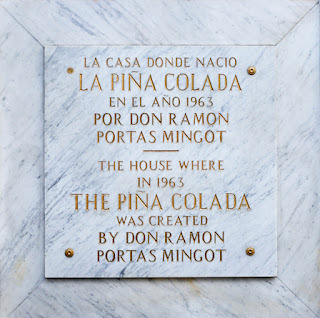 Ramón Portas Mingot also lays claim to the Pina Colada while bartending at The Barrachina in 1963. 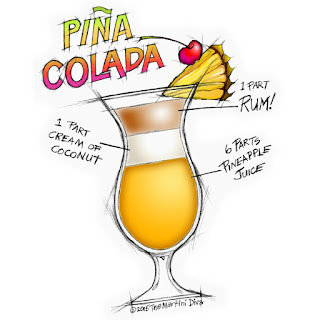 The Caribe Hilton's original Pina Colada Recipe (ala Pérez) is 2 ounces of white rum, 1 ounce of cream of coconut, 1 ounce of heavy cream, 6 ounces of fresh pineapple juice and 1/2 a cup of crushed ice blended until smooth and garnished with a slice of pineapple and a cherry. The Barrachina freezes their pineapple juice and coconut cream instead of adding ice then adds the rum. 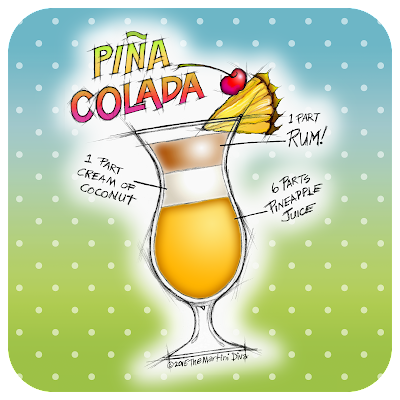 My love of the Pina Colada has led me to create a number of my own original Pina Colada style recipes and I'll probably end up doing several more in the future. After all, you just can't beat the combination of fresh pineapple, coconut and rum. SNEAKY TIKI COCKTAIL Some classic variations on the original Pina Colada include the Chi Chi which is a Pina Colada with vodka replacing the rum, the Amaretto Colada where the rum is replaced with Amaretto, and the Blue Hawaii where vodka is added with the rum and the coconut us replaced with Blue Curacao. Pina Colada Cocktail Recipe Art is available on prints, clothing, home decor, stationary and gifts. 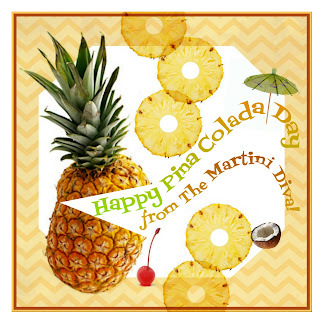 National Pina Colada Day is July 10th.